My Tuesday Tip is one way i've tried to reduce the dust that is being circulated via our forced air heating system. I once read about using cheesecloth as a tool to reduce the dust and allergens. 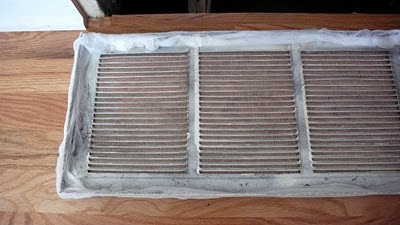 There are two ways to utilize the cheesecloth, one is to put it over the "air intake" for your furnace. 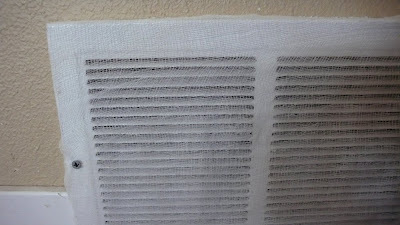 The second way is to put the cheesecloth over the heating vents in a place where it is important to reduce the dust and allergens such as a bedroom. We choose just to place it over our air intake, but you could just put it in the outtake vents. 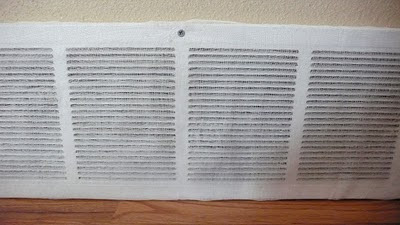 Below are some photos of how simple it is to place cheesecloth over the air intake. 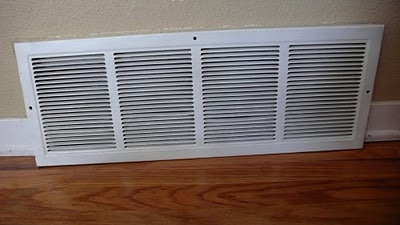 FYI, the air intake is a large grate in your home where the air is sucked into the furnace, it provides the first flow of air into the furnace that is circulated and heated and then blown throughout our homes as heat. 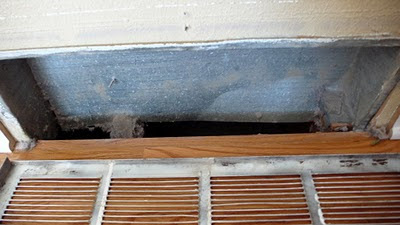 Most furnaces have a slot for a HEPA filter which should be replaced monthly. Go check yours now, they are fairly inexpensive and do a great job to filter out particulate matter. For $2-3 you can have a first line of defense against particulate matter flying through your home and eventually into your lungs! Don't be surprised by the lovely dust you find lurking! I simply use my vacuum attachment to remove dust and dog hair that collects! This is genius, and I'm off to get some cheesecloth. I love easy ideas that are helpful! Thanks! Interesting - I've never heard of this before! Thanks for sharing! This is great! I need to do this!